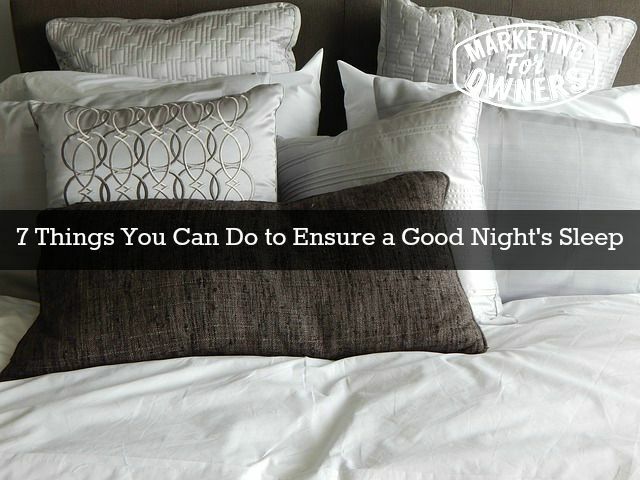 Today we are going to list out 7 things you can do to make sure that you are getting more sleep. Now, I bet you are wondering– what does sleep have to do with my business? Is he a nutritionist or whatever? No, I’m not a doctor, but I know what works for me and what works for others, I don’t make this stuff up. But I can assure you not getting much sleep regularly is not good for you and that means it’s not good for your business, for your mind, for your family, for those around you, for everything, for your longevity. I challenge you, find me a health professional, a genuine health professional who will tell you that “Yeah sure. Just get yourself 3 or 4 hours sleep a night, that will do fine.” They will not tell you that by the way. You need to be rejuvenated and most business owners because they have so much to do, find it tough to turn it all off, so try these. First of all, don’t stay up late to watch a TV show. With technology today, you can TiVo it, DVR it, Sky Box it, BT vision it, record it. You’ve got no excuses easy these days. You do not need to be there watching it live. On those electronics, turn them off at least an hour before bedtime. There is plenty of research about this. Is it the blue rays that come out, the gamma rays something like that. It keeps your mind away and it does not help so those of you that watch TV before you go to sleep, it is not helping. Your smart electronics are even worse than the television! A lot a people recommend those gamma ray glasses. If you hop on Amazon and search for gamma ray glasses, I think they’re about $20.00. I mean there are some very expensive ones but they block out these things. There’s also, on the iPhone, I think there’s a app called Flux that also changes the glare from the screen — that’s clever all this stuff. These things do help, a lot of people and I my friends are using it. End work at a time so you are not doing anything after that. The people that work for you finish working at a certain time and they get paid and that’s it, try to be like that. Don’t forget to get tell customers and people that you will not be taking calls after a certain time in the evening whatever it is. Stretch and meditate before going to bed; get some quiet time. You don’t have to meditate. Personally, I do not meditate, I’ve not even tried it but I do like a bit of quiet time. I have found it quite surprising how just turning everything off just sitting there, closing your eyes and enjoying the quiet for 5 minutes, 10 minutes. It’s quite surprising. In fact, it’s quite astonishing. But no, just try forcing it. Quiet time. It settles your mind and your soul. Don’t do heavy exercise before you go to bed. Do that in the morning. Don’t do at the end of day. Do it in the morning. Don’t eat after a certain time. Do not eat just before you go to bed. In fact, there is research that says you should not eat anything after 7p.m. Just don’t have anything else to eat. Google it, look it up, it is just not good for you. Ask a doctor. I read this from Arianna Huffington in her book, Thrive. She got it from a friend and nobody does this. Everyone sets some time to wake up but if you want to try and get 8 hour sleep, and you know you are going to be up by 6 or 7, then you need to know what time you have to be in bed by. Set an alarm clock for the latest time you need to be going to bed. Try a sleep monitoring app. This coincides with it being Tuesday and this is also our toolbox tip. I am going to recommend Sleep Cycle. It is an app that you can download from sleepcycle.com or through your smartphone. You just put the phone under the sheets and next to where you’re sleeping and screen them and it monitors your sleep patterns and you may know that in your sleep you have a lot of ups and downs. It’s REM time, that rapid eye movement time and all that kind of stuff. Some points in that Sleep Cycle app, you were in the deep sleep. Another part, you are in the light sleep mode and what it does, cleverly (don’t ask me how) — it monitors which part of the sleep cycle you are in and it wakes you up when you’re in the lighter one not in the heavy sleep. It’s apparently easier to wake up from the lighter sleep than the deep. It’s like “Oh, I don’t want to get up”. It knows. So if you set your alarm for around 7 in the morning, then it’s going to wake you up in a period from quarter to seven or quarter past 7 or whatever. But it’s clever. Try it. Don’t just take my word for it. Read the testimonials on the website. It’s clever stuff, try that. But anyway, over all, the sleep thing. But she took power naps, andextra power naps, but it is better if you just get it all in one go. We have so much going on. So much light electronic devices, everything going on. Try and switch it off. It will do you the world of good. Try and get eight hours eventually but start somewhere and just build it up an extra 10 minutes each week, an extra 10 minutes, an extra 5 minutes here and there. Get it up there, you will feel rejuvenated. It might change your life. Let me know. See you tomorrow. Which of these 7 would be hardest for you?? Can you believe that Jon has been marketing his own businesses for over 30 years? No, neither can he. Jon's contacts around the world gave their tips and secrets that he's tried and tested. And, now you can use the ones that worked and make your life easier, too.